Walking through four galleries on the first floor of the Norman Rockwell Museum (NRM) provides a look at 20th century artists whose works carry a common thread or design. Commonality, whether taught professionally, by happenstance, or by observation, has created masterful artists throughout the centuries. Visitors see the artist’s teacher’s teacher. “Keepers of the Flame: Parrish, Wyeth, Rockwell, and the Narrative Tradition” graces the 16 or so walls and pathways in connecting rooms. One of the shared and important denominators between Maxfield Parrish (1870-1966), N.C. Wyeth (1882-1945) and Norman Rockwell (1884-1978) is their skill at storytelling. With more than 60 works by 25 American and European painters, the exhibit reveals the lineage of American illustration to some 500 years of European painting through the long line of teaches who have passed along their wisdom, knowledge, and techniques to generations of creators. “Keepers of the Flame” displays the talents of some of the most recognized narrative-picture makers of the past century – to their artistic forbears reaching back to the Italian Renaissance. It shows how these three men, all of whom painted with the same principals and techniques as their artistic ancestors, produced what would prove to be iconic imagery and unforgettable narratives that defined them as keepers of the flame of traditional Western painting. While the words of the title are never spoken in this play, the message is clear. Good intentions or not, White people can seldom understand the experience of a Black person—especially when embedded in a culture that systematically supports racist and misogynistic patterns of behavior. In the world premiere of this topical and courageous play, playwright Rachel Lynett forces the audience to confront their own beliefs and attitudes. Set on the campus of an unnamed college in what the script identifies as “a ‘hip’ and liberal town in a red state,” an accomplished Black professor’s car is keyed with the “N” word. With tenure decisions looming, she doesn’t want to make a big deal of it, but a friend puts the event in the spotlight and before long, a Dean at the college demands that the professor organize an event to show that hatred and bigotry should not be tolerated. Soon, “Equality Day” becomes “Unity Week” and in the process, identity politics come to the fore. 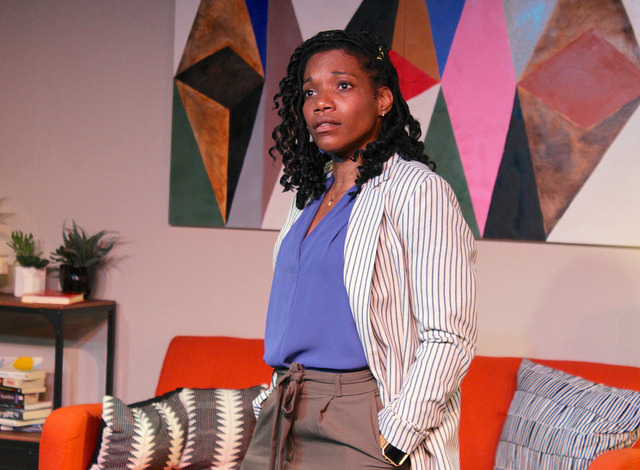 In the lead role of Cass Davis, Myxolydia Tyler demonstrates the mental anguish and physical exhaustion of having to be the representative of her race. She is particularly effective when, in her keynote address for Unity Week, she plaintively decries, “The problem is that no one is listening to anyone.” Viv, (Victoria Frings) is her girlfriend, a well-intentioned activist who can’t see her own privilege getting in the way of her causes. Parker, (Samy El-Noury) is trans and delivers some of the most cogent lines of the play. Dean West, (Andrea Cirie) is another well-intentioned white person who generates the idea for an “event” that is more public relations than effective, and young Mara, energetically played by Cathryn Wake, is a student with a habit of acting before she thinks. The story is not atypical of a college campus. There is much truth to the way the power dynamics spin out of control. At the same time, the characters became a bit stereotypical and the dialog slightly forced. Director Tiffany Nichole Greene knows how to find the best moments to make the point. As the show runs, hopefully the cast can feel more comfortable with an audience, they will tease out the danger that is inherent in each characters’ decision. We need more plays like this to enliven discussion and show what is so hard to talk about. Shakespeare and Company, Lenox, MA. Loneliness and social isolation are meaty topics for theatre and Simon Stephens’ “Heisenberg” explores these topics from the perspective of a 40-something year-old woman from New Jersey who meets a 75-year-old Irish butcher in London. On the surface they have nothing in common, but as the 90 minute one act unfolds, the unlikely duo stumble through random events that focus on the decisions that lead people to take actions in their lives that we might never have been contemplated. The reference to the Heisenberg Principle (also known as the Uncertainty Principle) is the metaphor for the possibility of what can happen in moments of the unknown. At Shakespeare & Company, Malcolm Ingram (Alex) plays a subdued introvert and Tamara Hickey (Georgie) is the extrovert. He seems likeable, and she is manic in her energy and body movement. 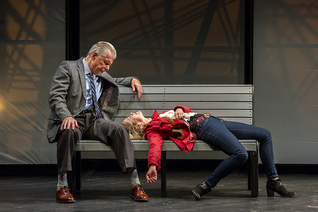 Director Tina Packer has her actors use the stage well, with every nuance planned and well executed, which keeps the pacing fresh and sets up a feeling that the audience is watching a dance of attraction and rejection. The moments of decision become tantalizing as the onlookers wonder what new direction is going to be taken next, and how the consequences might unfold. Stephens is a prolific playwright who received the 2015 Tony for Best Play with “The Curious Incident of the Dog in the Night-Time,” an investigation into the mind of an autistic teen that bombarded one’s senses with technology and sound. “Heisenberg” is much more subtle. Though it resembles a romantic comedy, it is one predicated on pain, and has unexplained holes that are expected to be acceptable. The audience never finds out why New Jersey-brash Georgie is working in London, and in this production, or how to understand why Alex is so impulsive. The excuse, perhaps, is that she is American and that seems to give her license to lie, hurl insults and behave without consequence. She is hard to like, and though Hickey is an immensely likeable performer, the character of Georgie remains fatally flawed. Perhaps that is why the “wise old(er) man” becomes a familiar archetype to stabilize her flightiness. It is fitting to celebrate Leonard Bernstein’s Centennial Year with a special focus on Mahler. Maestro Bernstein was acknowledged as one of the great interpreters of Mahler’s work, and Andris Nelsons has picked up that lofty mantle. On Saturday night, August 24th, Nelsons conducted the six-part Symphony No. 3, with his characteristic economy of motion and ability to find texture and meaning in the almost two-hour symphony. For audience members who love Mahler (the Mahlerians), this was a very special night. From the thunderous response, it was successful on all levels. Symphony No. 3 began with a brash introduction by horns and brass, then moved to drumbeats of a funeral procession before launching into a section in which various instruments played in a style Mahler referred to as “without regard for the beat.” Ironically, the first movement was written after the rest of the symphony, which gave it a feeling of a prequel for the later movements. Mahler’s musical textures were particularly noticeable as the dual harps played in unison and the percussion section propelled the musical story forward. Mahler seemed to have loved the idea of an instrument or instrumental section performed elsewhere in the hall, and on this night, a haunting post horn (flugelhorn) was heard from off-stage where patrons sat with their picnic baskets and bottles of wine, allowing the audience in the Kousevitzky Shed to feel surrounded by sound. 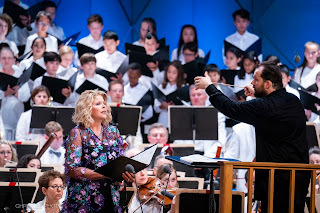 Guest artist Susan Graham’s rich contralto was contrast with the voices of the Women of the Tanglewood Festival Chorus and the Boston Symphony Children’s Choir, all singing what seemed to be bell tones in the words of Nietzsche’s Midnight Song from Thus spoke Zarathustra. The majestic final movement featured booming tympanis (two were on stage) and directions that Mahler wrote that instructed the music to be “Langsam” (Slow), “Ruhevoll” (Peaceful), and “Empfunden” (Deeply Felt). In 2007, music critic Joe Banno noted in The Washington Post that Mahler and Bernstein were “aesthetic twins.” He enthused that Mahler's symphonies “with their giddy fits of nostalgia” were a perfect match for Bernstein’s emotional style of conducting. Though Maestro Nelsons was a contrast in movement on the podium, the end result was still the same. Mahler’s tightly controlled musical style came alive in the hands of a gifted conductor. Imagine you had an opportunity to have 14 of the finest dancers with the New York City Ballet perform five works by one of America’s most renown choreographers….and that two of those pieces could be danced to live music provided by accomplished soloists. That is exactly what Daniel Ulbricht’s “Stars of American Ballet” brought to the stage. Jerome Robbins was born in 1918 in Manhattan’s Lower East Side. To celebrate the centennial of his birth, along with his contributions to American ballet, the entire program consisted of selections from his many masterpieces. Whether performed to the music of Tchaikovsky, Chopin, Bach or Stravinsky, Robbins’ choreography was always clearly American. Indiana Woodward and Andrew Veyette opened the program with “Andantino,” a pas de deux best described as intimate and sweet, including the last parting lift. The traditional ballet movements in this piece were relaxed by the jazz overlay. The unusual ratio of two male performers to one female dancer in “Concertino” opened up new opportunities for experimentation to Robbins. Some the aerial movements were very complicated, and the dancers appeared apprehensive on at least one maneuver. Otherwise, their coordination was magnificent. The highlight of the evening was “A Suite of Dances,” performed by Ulbricht with Ann Kim on cello. Although technically a solo, it had the texture of a duet because of the exchange between dancer and musician. As contradictory as it might seem, the fusion of classic ballet with cartwheels and forward rolls worked well to the music of Bach. Of significance was the immediate connection Ulbricht formed with his audience. Ulbricht again shined in “Chopin Dances,” which he performed with Anthony Huxley. Robbins’ partnering of two male dancers allowed for some good-natured competitiveness and impressive aerial lifts, using the rotational momentum of the dancers. Although first choreographed in 1945, “Interplay” remains ageless and fresh, and an excellent choice for a finale. Four couples playfully danced to the jazz score. It resembled parts of Robbins’ “West Side Story” in its division into two competitive teams, albeit these were more good-natured. Sebastian Villarini-Velez performed multiple tours en l'air in the second set. Cartwheels, leapfrog and back-to-back rolls added to the swing-time beat of the music. What better way to end the 86th season at Jacob’s Pillow Dance Festival than with an iconic American ballet, choreographed by an American legend? It’s cliché that mothers and daughters often collide; not so much mothers and sons. Tony Award-winning and prolific playwright Terrence McNally has penned a story of a relationship (or, better yet, non-relationship) between a woman and her son which comes to life 20-years after the young man’s death. “Mothers and Sons” explores the have and have-nots; the humans who populate the world who have love to give and to accept, and those who can only define the word selfishly. To some degree, the play is a history lesson presented by Katharine (mother) and Cal (the former partner of her gay son). Younger audience members who knew little about the AIDS epidemic of two decades ago will undoubtedly become enlightened about this 20th century scourge. For the rest of us, the story resonates as a reminder of the not so distant past. At first, Director James Warwick introduces the lead characters as static and one-dementional with wide physical space between them for tension to fill and encompass both. Slowly, McNally’s dialog in the hands of Warwick, form characters who are able to communicate, although rarely on an even plane. Over the years, Shakespeare & Co. resident actress Annette Miller has specialized in portraying historic figures; i.e. Maria Callas, Martha Mitchell, and Golda Meir. Oftentimes, it has felt as if Miller’s own personality superseded each of these famous women. 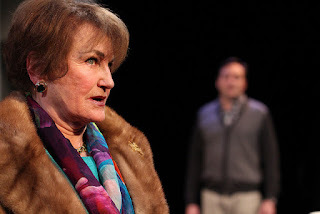 Miller is certainly a formidable actor, and credit goes to her portrayal of Katharine as sad, brittle, and stuck in a world of her own making. It is especially enlightening to see her interpret an everyday woman, warts and all. Bill Mootos, as Cal, speaks of the values that make humans, well…human. In a quiet manner and never didactic, Mootos delicately explores the subjects of caring, love, commitment, and strength. Miller and Mootos craft roles whose backbones are weak with fear; their commonality. While hesitant, Cal risks enough to move on in life. While Katharine tries, ever so slowly, the audience sees hope for this woman. In smaller but important roles are David Gow as Cal’s husband, Will. Gow’s outright condescending attitude toward Katharine is, at first, prickly and pompous. Fortunately, the dialog and Gow’s acting skills shape a real person who the audience can choose to like or not. Evan Miller, as Cal and Will’s son Bud, is charming and cute (but not too cute) spouting some words of wisdom beyond his years. Note: On alternating evenings, Bud’s role is played by Hayden Hoffman. Houston has a right to be proud of its internationally acclaimed Houston Ballet. Back at Jacob’s Pillow for the first time in 40 years, 33 members of the company performed four exquisite numbers ranging from classical ballet to contemporary and modernist forms of dance. Three pieces were choreographed by acclaimed Australian choreographer Stanton Welch, Houston Ballet’s Artistic Director since 2003, and one by Trey McIntyre, who formerly danced and choreographed with the Ballet, and who also is an alum of the Jacob’s Pillow program. With the Houston Ballet in residence for a few days, audience members were treated to the world premiere of Welch’s ballet, “Just,” which was commissioned by Jacob’s Pillow. In three movements, dancers moved contrapuntally to music demonstrating physical strength through isolated movements, lifts, and symbiotic fluidity of motion. At one point, the dancers’ footfalls formed the percussion to complement the music—a technique that was later used in the concluding piece, “Clear,” in which dancers created percussion by slapping their bodies to emphasize a portion of the dance. “Clear” is a piece Welch created when living in New York City prior to 9/11. Featuring seven men and one woman, the piece actually felt “urban” even though it focused on beauty of the male dancer. At one point, all dancers became bathed in golden light, and the stage picture that emerged was reminiscent of Ted Shawn’s work--the extraordinary athleticism of leaps, pirouettes, grand jetes, and the pas de bourrée. Along more classical lines, “Sons De L’ame” featured dancers whose bodies seemed to twist and meld into each other. With similar poses to start and end the piece, the audience was treated to three movements that expressed human desire and intimacy. It would be impossible to mention even a fraction of the outstanding principal, solo, demi solo, and corps de ballet dancers by name, but what might be even more impressive is how well the members of the Ballet seemed to enjoy the people with whom they shared the stage, and even more, their connection to the audience. Sadly, the Houston Ballet lost its home during Hurricane Harvey in 2017, but they are now returning and with the skill and talent of its artistic team and dancers, audiences can expect to see more innovative performances emerging from this hotbed of creativity. “Fancy Free” was one of composer Leonard Bernstein’s contributions to the war effort. Written in 1944, the piece expresses the sweet short story of three sailors on a one-day pass in New York City. Needless to say, they soon meet three ladies and pair up. This was the fairytale at Tanglewood’s Shed. Dance and music told the story. It’s not often that dance is performed at Tanglewood; even dance with music – in this case, the Boston Symphony Orchestra, of course, making Saturday night a double-barrel treat of two art genres joining forces. Oftentimes, in pieces like “Fancy Free,” the orchestra simply accompanies or is background music to the dance. In the case of “Fancy Free,” the two art forms were symbiotic in purpose and execution. BSO Conductor Andris Nelsons lead the full orchestra as and Mikko Nissinen choreographed the Boston Ballet troupe. The latter danced in a large section to the left of the stage, with cartoon-like freestanding scenery crafting a joyful atmosphere. “Fancy Free” was the perfect choice to begin the evening’s program and was obviously enjoyed by the audience, which gave an instant standing ovation. To continue the All Bernstein Program after intermission was “Divertimento for Orchestra.” Eight vignettes, each a different music form with no obvious connection or order between them may seem a bit disjointed. However, the work was a series of one delight followed by another; i.e. waltz, mazurka, samba, blues, march, and even the turkey trot. The BSO members might have had as much fun performing as those listening. Next, violinist Baiba Skride, who has been a featured soloist literally throughout the world, together with Nelsons and the BSO created “Serenade for Violin, String Orchestra, Harp, and Percussion.” Skride’s looked the part of a serious young woman tackling an equally thoughtful work. Set in five movements, Skride took center stage, never faltering or tiring in what was an extremely long work. Spitting rain subsided about an hour before the concert’s start. Surely, Leonard Bernstein would have been thrilled by the Tanglewood turnout, and the expert talents of the BSO and Boston Ballet. 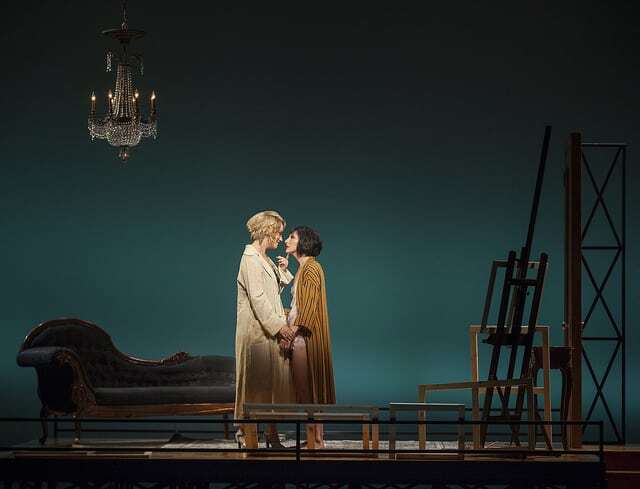 A sumptuous world premiere musical performs at Williamstown Theatre in Lempicka, based on the life of Polish art deco artist Tamara de Lempicka. Spanning the Russian Revolution, Parisian high life between the World Wars, and the decadent underworld of bar rooms and brothel folk, this musical tells the tale of one woman’s journey from destitute refugee to rising star of the art world. 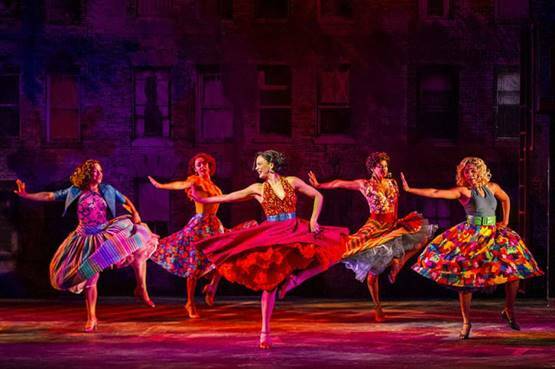 From ensemble to leads, each performer in this production is outstanding, and the voices and musical numbers, even if one is not a fan of contemporary musicals, are stunning. In the demanding central role of Lempicka, Eden Espinosa is superb. Her stage presence, singing and acting carry the show; she is a phenomenon onstage. Andrew Samonsky playing Tadeusz, Lempicka’s first husband, is equally brilliant. He strikes just the right blend of displaced aristocrat and outshone lover, giving as strong a performance as Espinosa. Onstage together, these two rock the house. The sultry voice and presence of Carmen Cusack as Rafaela, Lempicka’s lover, provide a compliment to the main leads. The audience falls under her sensuous spell as much as Lempicka herself; their number “Stillness” is magical. Nathaniel Stampley and Rachel Tucker as the Baron and Baroness, and Natalie Joy Johnson as Suzi Solidor add strong character performances and impressive vocals to an already amazing array of onstage talent. Vivid and creative choreography by Raja Feather Kelly ranges from beautiful stills of the ensemble in painting frames to speakeasy jazz moves – dance seems to be everywhere, seamlessly interwoven throughout this show. Extravagant costumes by Montana Levi Blanco reflect Russian royalty as well as impoverishment, swank Parisian style and California cool, all in a few hours onstage – truly a visual tour de force. Scenic design by Riccardo Hernandez reveals artistic genius: one leg of the Eiffel Tower, and we are in Paris, while doors, divans, platforms and even a bar room with a huge mirror spin the audience and the performers to many other settings. Director Rachel Chavkin has done an amazing and imaginative job uniting a powerful cast, wieldy musical numbers and dizzying plot into a coherent and enjoyable if lengthy production (Act I runs one and a half hours.) Lempicka is a musical on the grand scale; bravo to everyone involved! A youthful Shakespeare penned this early comedy and youthful actors performed a hilarious romp in Shakespeare & Company's production. 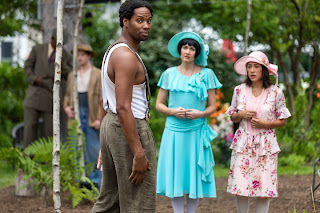 Love's Labor's Lost is a feast of language that presents a challenge to directors and actors since topical references and archaic language dominate a thin plot line. Director Kelly Galvin cut the script not only to secure a 90-minute production but also to make outdated allusions and complex puns understandable and entertaining. She accomplished this feat by effectively using the outdoor setting, the physicality of the agile actors, and techniques of commedia. The outdoor space made a natural setting for the Princess of France and her three ladies. They were to be "lodged in the field" because the King of Navarre and his three couriers had just taken a vow to study, fast, and shun women. A flat wooden oval served as a stage. A tent (doubling as a dressing room) was behind the stage up a small hill. The rest was wide-open grass flanked by trees. The expansive setting also aided the energetic actors in their running, dancing, rope pulling, and sword fighting scenes-all devices to better the audience's understanding of the convoluted language and play on words. Commedia characteristics were portrayed by the Spanish Don Armado in his exaggerated accent and courtly gestures. Further comedy was portrayed in Luke Haskell's clowning of Costard's "remuneration" speeches as well as Dull's constant use of malaprops. At first sight of her the King of Navarre has fallen in love with the Princess of France and his courtiers with her ladies. The men break their oath of shunning women by each writing a love sonnet to his chosen lady. Consequently, oilier the hilarious slapstick way the men try to conceal their broken vows, they implore the witty Berowne played admirably by David Bertoldi (with his expressive vocals and strong stage presence) to justify their actions. Berowne says it is not natural for young men to shun love, for their study now is in women's eyes and beauty. At one point in this fun tilled battle of the sexes, the men disguise as Muscovites to woo the women. Forewarned, the women wear masks and amotdiei' woman's jewels so that the men pledge love to the wrong lady. Here Shakespeare employs actual "Masque” movements as each pair goes off for a private conversation, two by two like a formal dance. This play has the seeds for later Shakespearean comedies such as Mid Summer Night’s Dream and Much Ado About Nothing. The Pageant by the Nine Worthies in LLL is similar to the play of Paramus and Thisbe put on by the workmen at the end of Mid Summer. The witty banter between Berowne and Rosaline looks forward to the wordplay of the more complex Beatrice and Benedick in Much Ado. The playful romp of this production culminates in a joyful battle with water gums and balloons. At the height of the conviviality, the messenger Marcade enters announcing the death of the Princess's father. The tone shifts to somber. The men must postpone their courtship with promises to do atonements for a year. Then the women will return. The production ends with a mournful song in acappella followed by a stately dance by all the actors. 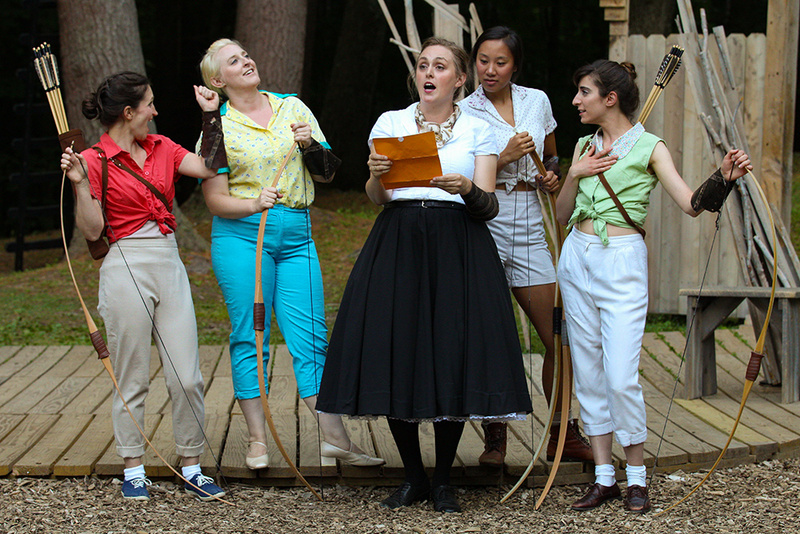 Shakespeare and Company has worked its magic yet again with a new production of As You Like It, a show sometimes criticized for being overly “talky” and formulaic but that in the hands of S&Co.’s artistic director and director of this production Allyn Burrows, is anything but. Setting this frolicsome, light-hearted and fanciful comedy in the outdoor Roman Theatre venue provides just the right atmosphere – especially as the sun begins to set as Act II unfolds during the 5PM show. S&Co. actors are brimming with their trademark physicality, flexibility and bawdy humor along with their wonderfully clear and audible vocal delivery. The action takes place mainly in the forest of Arden where the brilliant Rosiland and her cousin Celia have landed after being kicked out of their comfortable homes by Celia’s ambitious and conniving father, Duke Frederick senior, her uncle. Simultaneously, Orlando has been banished from his home due to his older brother Oliver’s murderous intent to keep him from his rightful inheritance. 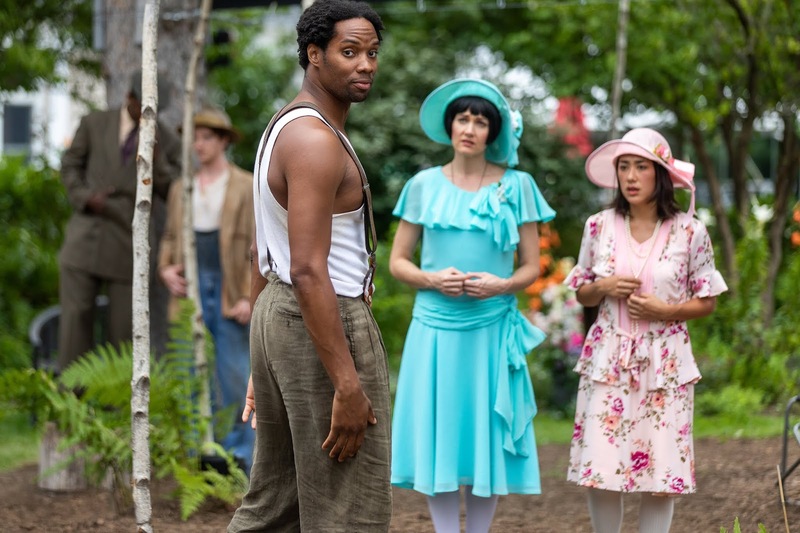 Touchstone, Jaques, LaBelle, Silvius, Phoebe and Aubrey, are relatively minor characters, but nevertheless, carry much of the weight of the entertainment value of the show. MacConnia Chesser as Touchstone delivers a brilliant and hilarious re-interpretation of the role as a woman, playing opposite Thomas Brazzle, who doubles as both Oliver and a male version of Shakespeare’s character Audrey, here re-invented as “Aubrey,” who only has eyes for Touchstone. Ella Loudon is similarly tasked with the double casting as both the love-struck Phoebe, who falls for Rosiland in her male disguise, and the reinvented role of a very French LaBell. Gregory Boover serenades with guitar playing and singing as poor Silvius, who cannot be deterred from his undying love for Phoebe. Deaon Griffin-Pressely delivers a charmingly sincere and enthusiastic Orlando, the perfect foil for the brilliant Rosiland. Nigel Gore as both Duke Frederick and Duke Senior, Zoe Laiz as Celia and Adam, and Mark Zeisler as Charles and Jaques round out this accomplished and skillful cast, but Aimee Doherty’s Rosiland alone is worth the price of the ticket. A demanding role, she plays with superb subtlety and razor-sharp wit. Allyn Burrows is truly a gifted director and clearly in his element as he manages to create this romp in Shakespeare’s forest of Arden. He selected to set the play in the Roaring 20’s– what better time to pick than one in which women got the vote and were given more choice in whom they would marry? The use of music is noteworthy and adds to the production. Burrows and his cast have created a marvelously entertaining production. Michael Tilson Thomas (MTT) is no stranger to the BSO, the work of Mahler, or the style of Leonard Bernstein. In the August 12th concert of the Bernstein Centennial Summer season, MTT conducted a fitting tribute to the man he met when he was a Tanglewood Fellow. In 1969 MTT was assigned to conduct the off-stage portion Bernstein’s on-stage conducting of Mahler’s Second Symphony. Bernstein casually mentioned that he was thinking of conducting the piece by memory, rather than looking at the score. On Sunday, MTT performed the same way—conducting Mahler’s Symphony No. 1 in D “off book” and with some of the same gestures he had learned from Maestro Bernstein. The concert began with the whimsical “Agnegram” written by MTT for San Francisco Symphony board member, Agnes Albert, for her 90th birthday. MTT wrote the short piece using a musical annotation of the letters of her name and incorporated some of her favorite tunes—from “The 1812 Overture” to “Yes, We Have No Bananas.” As a prelude to Rachmaninoff and Mahler, the piece was well received and showcased the author/conductor’s ability to write accessible, yet clever music that warmed the audience on a cool rainy day. Rachmaninoff’s “Rhapsody on a Theme of Paganini,” Opus 43 for Piano and Orchestra featured the extraordinary Igor Levit, a pianist of technical wizardry and interpretive sass. A plane flew overhead just as Levit was immersed in one of the piece’s most famous passages. The sound of the plane trailed off as the piano’s notes lingered in the air, magically accompanying the plane’s passage above. The second part of the program featured Mahler’s Symphony No. 1 in D, with music so effecting the audience cheered for close to 10 minutes, acknowledging the many soloists who contributed to the piece that has become known as one of the bridges from the Romantic to the Modern period of orchestral compositions. Kudos were given to the French horn section, which masterfully played the passages key to the first of Mahler’s four Das Knaben Wunderhorn (The Boy with the Horn) symphonies. Mahler identified the piece as a “symphonic poem,” and MTT and the BSO left no doubt as to the story Mahler told in this symphony. It’s understandable that MTT and Bernstein are both known for their interpretations of Mahler. This concert solidified their reputations. And at the end of the concert, the sun came out. 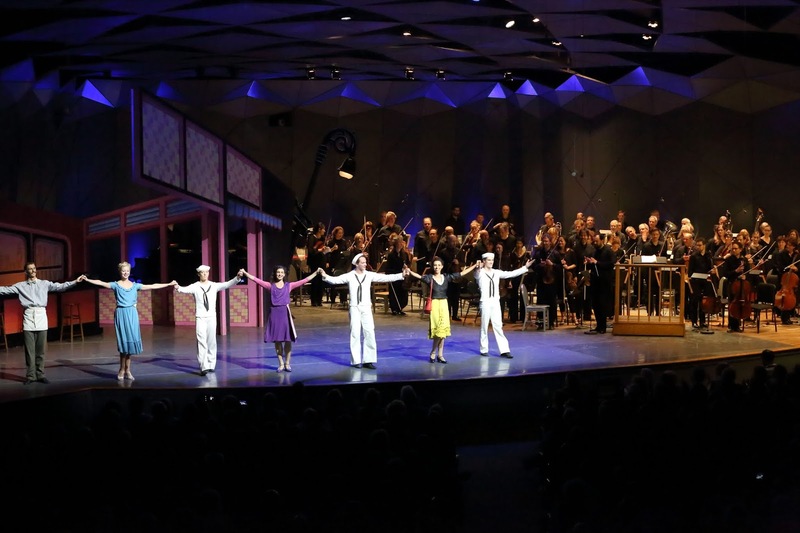 “West Side Story” opens big! It was opening night, a full house, patrons dressed in their finest (rare for the casual Berkshires), and an instantaneous standing ovation. To repeat the story’s plot would be wasting the reader’s time. Here’s a summary…the set, New York City slum neighborhood; the time, the late 1950’s; our protagonists, star-crossed young lovers a la Romeo & Juliet; the “bad guys,” no one and everyone. Describing Barrington’s production in one word would be “honesty.” Director Julianne Boyd seems to have struck a match to set off a red-hot fury of energy and smoldering emotion within every actor; all are true to his/her character as a living, breathing person, and as a representative of a small part of a community, warts and all. 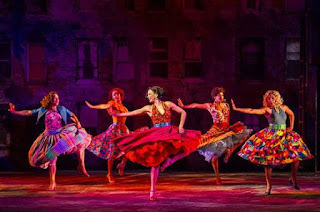 Boyd must share the accolades in creating this near-perfect presentation of “West Side Story” with Choreographer Robert La Fosse. The first notes of the musical are those of the Jets snapping their fingers in unison; this is a family. Then there’s the famous “Dance at the Gym,” a powerful contest of one-upmanship with brutal stakes. Since no specifically named credit in the program book is given to “fight coordinator,” it seems safe to assume a collaboration of Boyd and La Fosse construct the intricacies of the “The Rumble” well-above an audience’s expectations. Even though everyone knows the results of the scene, the sound, lights, and dangerous moves at speeds almost too fast to see are extremely frightening. Will Branner and Addie Morales (Tony and Maria) are as sweet, innocent, and in love as their characters can possibly be. Yet, there is honesty in their music and relationship that cautions them. Branner literally sets the tone of his naïve Tony with “Something’s Coming.” A few minutes later, he’s telling the world of his love in “Maria.” Rather slight in physique and very young looking, Branner’s vocal skills belie his years. Morales is a more genuine Marie than ever in other productions or movie. Besides her lovely soprano voice (with Branner in “Tonight”), Morales brings sincerity to Maria through her eyes and especially her smile. Tyler Hanes’ Riff takes the accolades as the best dancer onstage. Add his clenched jaw and no-smile face, Hanes makes a formidable character. His counterpart, portrayed by Sean Ewing, dons his Bernardo with smooth bravado. Skyler Volpe, as Anita, is a musical director’s dream: she sings, she dances, and she acts with all skills equal. Set Designer Kristen Robinson has built an inner-city tenement of 50+ years ago; tall and bleak with tinges of light and even stars. Maybe there is hope for these characters? 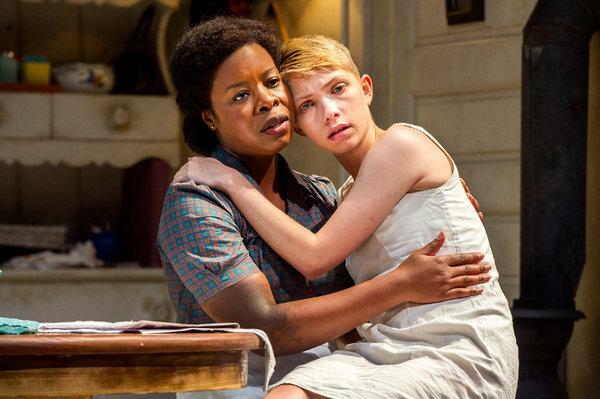 Carson McCullers’ timeless, poignant drama, “The Member of the Wedding” (based on the 1946 novel) is given a fresh revival at WTF this summer. This newly mounted production deserves much praise for its sensitive performances. Set in the American South in August, 1945 in a small town, the play unfolds leisurely like a torrid afternoon, whose blazing heat is tempered by splashes of refreshing humor as cool as a glass of ice cold lemonade. Berenice Sadie Brown (Roslyn Ruff), the African- American housekeeper of the Adams family (no, not That Adams family), spends nearly the entire play cooking in the tiny kitchen trying to quell the pressing anxiety of her charge, 12-year old Frankie (Tavi Gevinson). The youngster is an outsider constantly questioning Berenice about the inequities and injustices that surround them, in their small town and in the world. The third member of this existentially-challenged club is Frankie’s younger cousin and neighbor John Henry (Logan Schuyler Smith), whose impressionable nature contrasts beautifully with Frankie’s intellectualism. This triad of characters provide the heart and soul of McCullers’ play in balanced and assured performances. Ruff’s portrays a strong-willed and loving maternal figure; neither too soft or too hard. Her honesty and warmth are lovingly conveyed to both Frankie and John Henry. Gevinson’s Frankie at first comes across as abrasive and almost obnoxious, but later she evolves into a gentle and thoughtful young woman, displaying both her skill as an actor and McCullers’ perceptive characterization. Finally, Smith’s John Henry is a joy to behold. A truly natural performer; this young actor demonstrates great daring and risk, especially in the scenes where he dons Frankie’s pink fairy costume. Indeed, the story touches on the contemporary issue of sexual identity, both in Frankie’s boyish behavior (and her navy crewcut hair) and John Henry’s aforementioned playfulness. The cast is rounded out by three other central characters: Berenice’s beau T.T. Williams (Leon Addison Brown), her foster brother Honey Camden Brown (Will Cobbs), and Frankie’s alcoholic father (James Waterston). The actors depicting the men offer three faces of Pre-Civil Rights American South -- the obliging, but no less strong black man (Brown); the fed-up with racial inequality black man (Cobbs); and the inherently racist white man (Waterston). All express integrity and honesty in their portrayals of rather one-dimensional characters. Much praise must be given to Director Gaye Taylor Upchurch’s skill in eliciting fine performances from all the, which in lesser hands, could come across as pretentious and overly poetic. Laura Jellinek’s set design is simple and historically accurate. The small downstage left kitchen is literally dwarfed by the towering clapboard backdrop. Metaphorically, this seems to be saying that the outside world constantly and threateningly looms over the three principal characters’ claustrophobic existence.